(Bloomberg) -- The European Central Bank would be stuck with record-low interest rates for another five years if it decided to adopt a policy of temporary price-level targeting floated by former Federal Reserve Chairman Ben Bernanke -- with potentially negative consequences. Joerg Kraemer, Commerzbank’s chief economist, argues that the ECB would face “the risk of dangerous bubbles” in markets and real estate if it kept its benchmark rate at zero for much longer in pursuit of faster price growth. 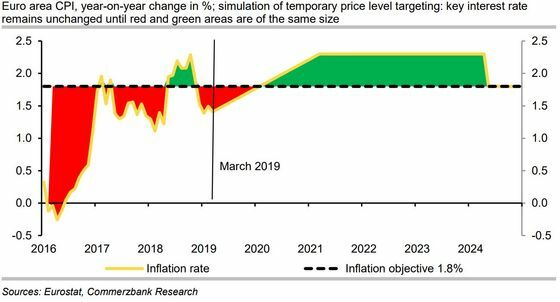 Central banks around the world have struggled to bring inflation back into line with their goals since the financial crisis, triggering alternative policy suggestions. In 2017, Bernanke highlighted the idea that officials could allow inflation to overshoot target to make up for previously weak readings. Olli Rehn, governor of Finland’s central bank and one of the contenders to succeed Mario Draghi as ECB president in November, embraced the concept last year. He said it needed a thorough analysis as part of a policy review he’s advocating. “The fixation on preventing low inflation rates is exaggerated,” Kraemer wrote in a note published Wednesday. “Instead, the ECB needs a strategy of comprehensive stabilization” that would also focus on financial stability. The ECB last month prolonged the period of record-low rates until at least the end of this year, and Draghi said that a weaker economy will delay but not derail the return of inflation to the goal of just under 2 percent. The Governing Council is scheduled to meet next Wednesday.